Former Allen County Sheriff Sam Crish, right, exits the U.S. District Court in Toledo with his attorney Zachary Maisch on Monday afternoon. 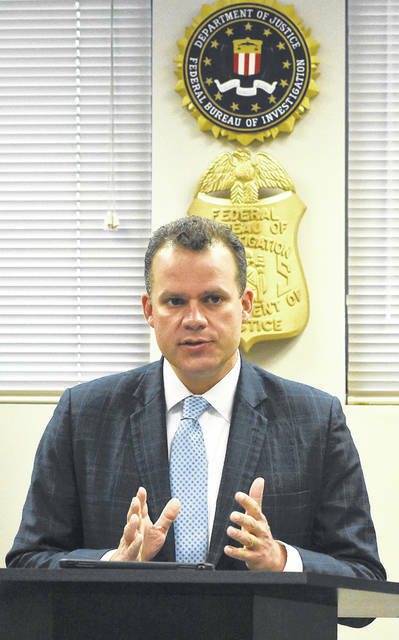 Justin Herdman of the United States Attorney Generals office addresses the media during press conference held at the Lima Federal Bureau of Investigation office to announce the indictment of former Allen County Sheriff Samuel Crish. FBI Special Agent in Charge Stephen D. Anthony, center, lays out the case against former Allen County Sheriff Samuel Crish, while U.S. Attorney Justin E. Herdman listens. Former Allen County Sheriff Sam Crish exits the U.S. District Court in Toledo on Monday afternoon. FBI agent Alvin Winston talks about the case against former Allen County Sheriff Samuel Crish. See past coverage of the Samuel Crish case at LimaOhio.com/tag/crish. LIMA — Former Allen County Sheriff Sam Crish faces decades behind bars following his indictment Monday on a host of federal charges ranging from extortion to soliciting bribes to making false statements to law enforcement officials. Twenty-one months after agents from the FBI entered Crish’s office armed with a search warrant, U.S. prosecutors and agents from the FBI on Monday provided some clarity for the reasons behind the raid. 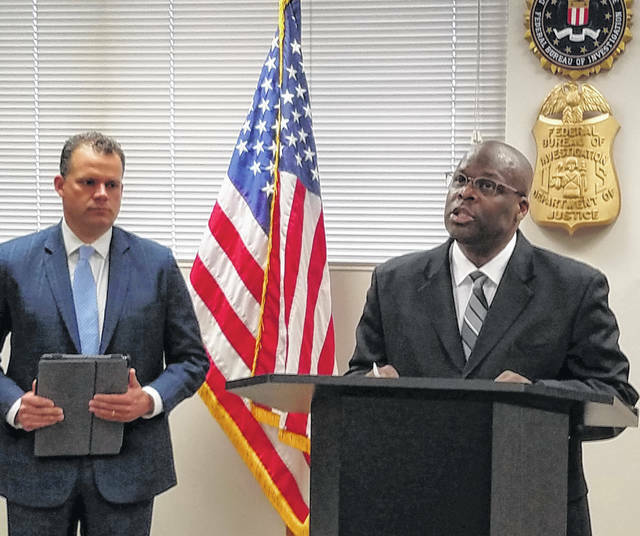 United States Attorney Justin Herdman said during a noon press conference Monday in Lima that Crish had been named in a six-count federal indictment that was opened earlier that morning. 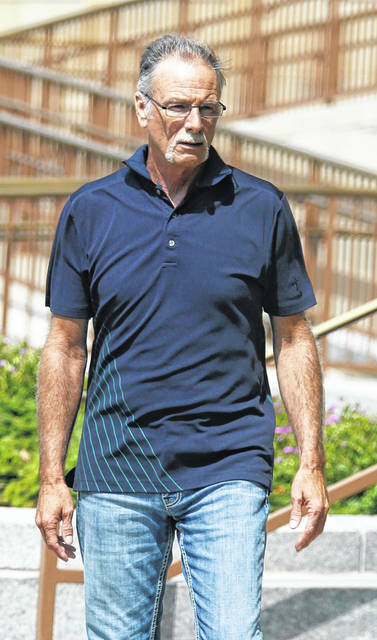 The former sheriff turned himself in to federal authorities in Toledo and appeared for a preliminary hearing in U.S. District Court at 3 p.m.
During that hearing, Crish pleaded not guilty to charges contained in the indictment, including two counts of extortion, three counts of soliciting bribes and a single count of making a false statement to investigators. Crish was released following the hearing on a $50,000 signature bond, an FBI spokesperson said late Monday afternoon. Crish is also required to have no contact with the alleged victims, and his travel privileges will be limited to Ohio, Pennsylvania, West Virginia and Maryland. According to the federal officials, the former sheriff was indicted for “asking for and taking bribes from drug dealers, people arrested in prostitution stings, suspected gamblers and others.” The indictment alleges that Crish extorted or solicited nearly $100,000 from five individuals between 2012 and 2016. The FBI spokesman said no other law enforcement personnel in the county are under any investigation connected to the Crish incident. Current Allen County Sheriff Matt Treglia, reacting to the news that Crish had been indicted, seemed eager to put that chapter of county history in the past. The indictment against Crish outlines alleged dealings between the former sheriff and five separate Allen County residents who reportedly gave him cash in exchange for special considerations and illegal police protection. 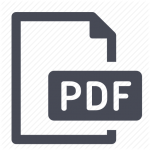 In one instance in 2012, according to the indictment, Crish accepted $50,000 in two separate transactions from an individual identified in official documents only as Person 1. The money was given to Crish in an alley behind the sheriff’s office in exchange for the sheriff’s help in landing Person 1 a position as a nurse at the county jail. That individual was hired at the jail, and Crish was to repay the loan at a rate of $480 per month, according to information provided by the FBI. Person 1 also loaned the former sheriff $1,500 in August of 2015, which was repaid, and $6,000 in January of 2016, according to the indictment. In another example, Crish reportedly agreed to look the other way when “Person 2” staged a party at which admission was charged and liquor was sold, generating a profit of nearly $15,000. Crish reportedly received $20,000 in cash from Person 2, with a promise to repay the loan with $5,000 interest. The indictment states that Crish said he intended to gamble with the money. Person 2 pleaded guilty in September 2014 to felony drug charges and was sentenced three months later to 24 years in prison. Persons 3 and 4 as identified in the indictment each operated used car establishments in Allen County, and each were entangled in prostitution stings in 2015. Person 3 gave Crish a check for $7,000 and eventually saw solicitation charges against him dismissed, allegedly at the former sheriff’s insistence, according to the indictment. According to the indictment, Person 4 loaned Crish $10,000 in cash on Nov. 3, 2015, one day before Person 4’s arrest at a motel in Lima as part of a prostitution sting. Crish reportedly stated that he needed the money to repay other individuals who had loaned him money and that he would lose his position as Allen County sheriff if he did not repay his debt. Person 4 never faced criminal charges stemming from the sting. The fifth and final individual described in the indictment owned a grocery store in Allen County and allegedly gave Crish a $2,000 loan in exchange the former sheriff’s vow to deflect an unspecified agency from conducting an investigation into that person’s suspected illegal gambling operations. Crish resigned from office on Jan. 31, 2017, less than four months after the FBI raid. 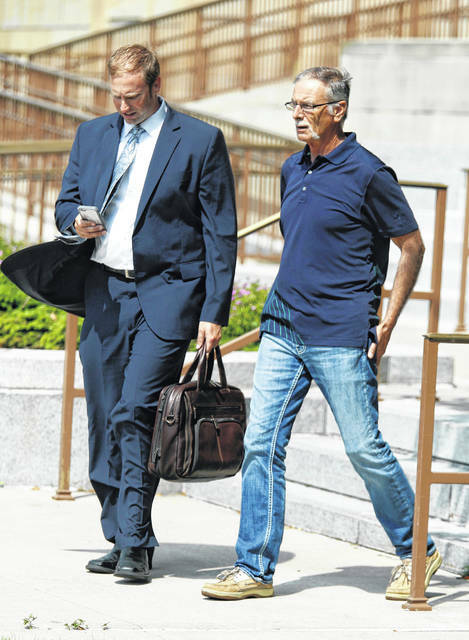 No charges had been filed against Crish in the months following raid, but the former sheriff’s previously unknown gambling addiction did come to light in the months following the FBI action. Shortly after the bureau’s investigation was opened, Crish checked himself into an inpatient treatment program to address an unidentified “serious personal issue,” his attorney, Michael Rumer, said in a written statement early in 2017 on behalf of his client. Crish later divulged he was in a Virginia treatment facility for 28 days because he was a compulsive gambler. Several civil lawsuits reportedly linked to Crish’s gambling debts subsequently became public following those revelations.